I picked up a basket of plums at the farmer’s market the other day. 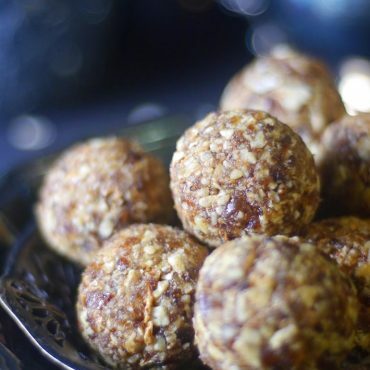 They looked beautiful, but sadly tasted… meh : / Isn’t it a shame when that happens? What to do… Seeing as I didn’t want them to go to waste AND since I’ve been in total ice cream mode lately, that seemed like the simplest alternative. And you know what, it turned out amazing. Creamy, flavorful, tangy and sweet. I really love pairing stone fruit with balsamic vinegar and maple. You can’t go wrong with that combo, each flavor highlight the others beautifully. 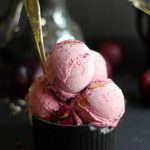 If you’re into this flavor fusion, you may also like this balsamic strawberry and basil ice cream (it’s nut-free, too). And of course cooking that fruit mixture first (and adding that hint of tapioca) ensures you don’t end up with that dreaded dairy-free-refined-sugar-free #icyicecreamfail. 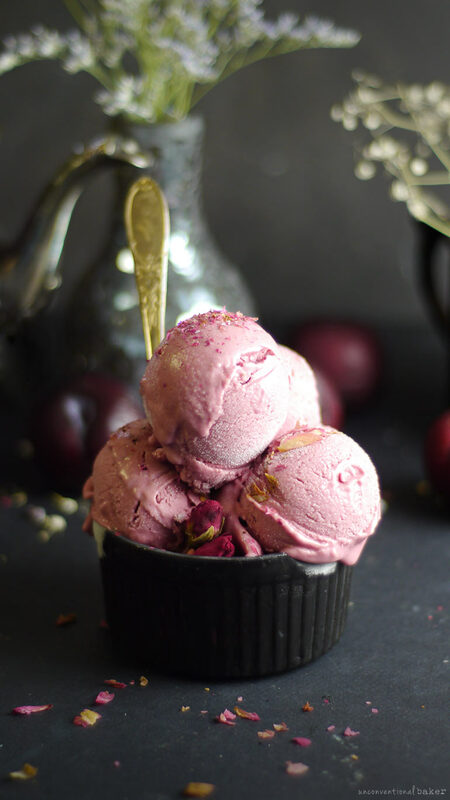 A creamy, no-churn fruity vegan ice cream — perfectly tangy and sweet. Not a hint of iciness despite being dairy-free. Made without refined sugar. Combine all plum mixture ingredients in a medium-small sauce pan and bring to a light boil on medium-high heat. Once the mixture begins to bubble continue simmering for 10 mins, stirring occasionally. Remove from heat and cool on a wire rack until mixture is at room temp. 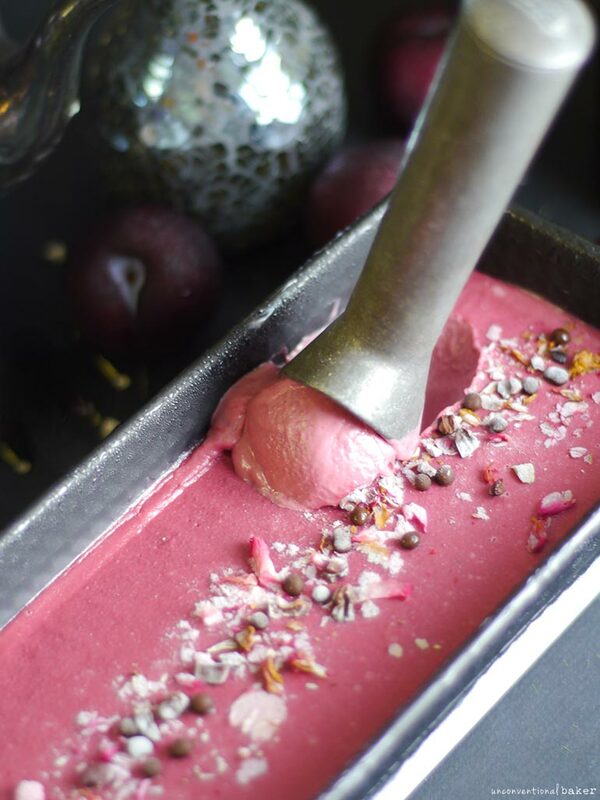 Blend all ice cream mixture ingredients as well as the cooled plum mixture in a high power blender until smooth (use your tamper if using a Vitamix to get smoothest results). Transfer into a freezer-safe container of your choice and chill for 5-6 hours or overnight. Thaw out on the counter before serving and enjoy! 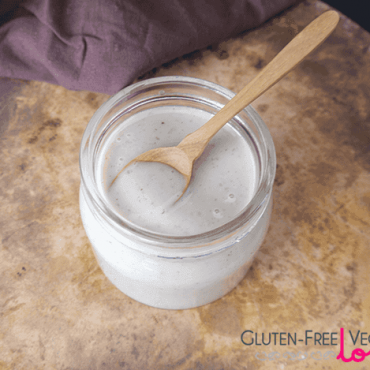 Disclaimer: This recipe contains affiliate links to the following products: maple syrup, balsamic vinegar, tapioca powder, raw cashews, pure vanilla extract, salt, ground cardamom, high power blender. I don’t know why, but looking at this recipe I feel I could make it with rhubarb, which is in season right now unlike plums! I’ll give it a try very soon! That sounds great :) Enjoy! 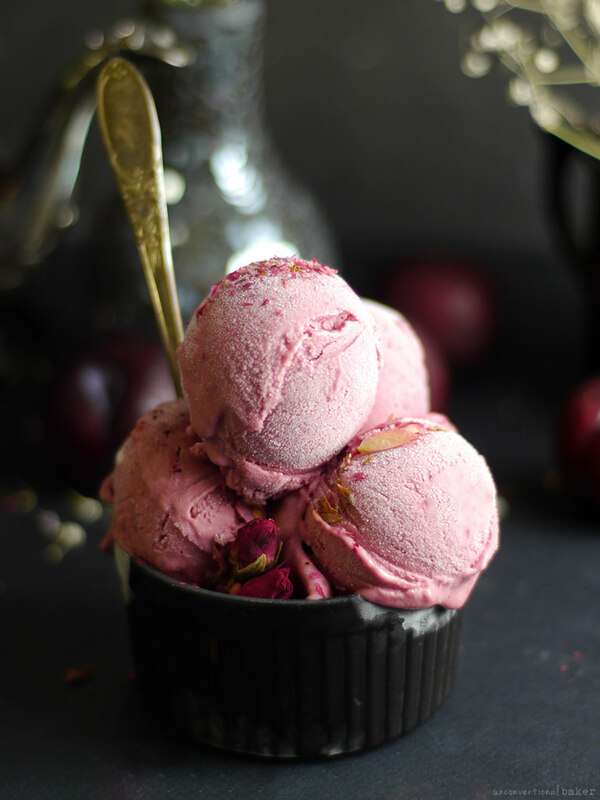 With this heat wave and the plums right in season, I also made the plum version since the one I made with rhubarb was delicious. I felt like using star anise, ginger and licorice root for the spice mix, turned out great! Stumbled across your blog and fell in love with it! Thank you so much for all your simple recipes and beautiful photos. Do you think it would be alright to use arrowroot powder instead of the tapioca powder for this recipe? Hi Kim, thank you so much for your kind comment, and absolutely — arrowroot would be fine here. OMG! probably the most beautiful ice cream I have recently seen! Thanks :) I’m not always so good with scooping ice cream for photos, but thankfully this one was fairly photogenic ? 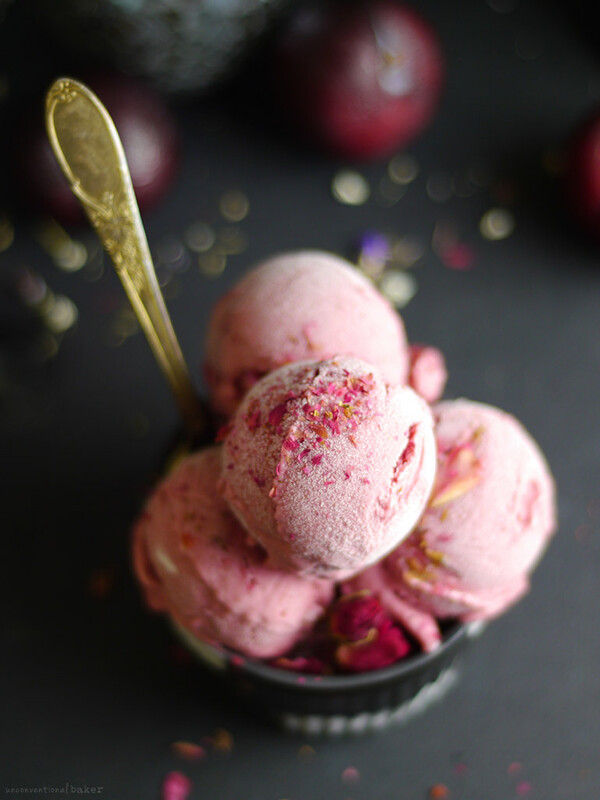 This is the dish of ice cream every little girl dreams about–pink, scooped high, and sprinkled with flowers! I love the way you styled and decorated it. Heck I love the way you even decorated the tray you were going to scoop from! 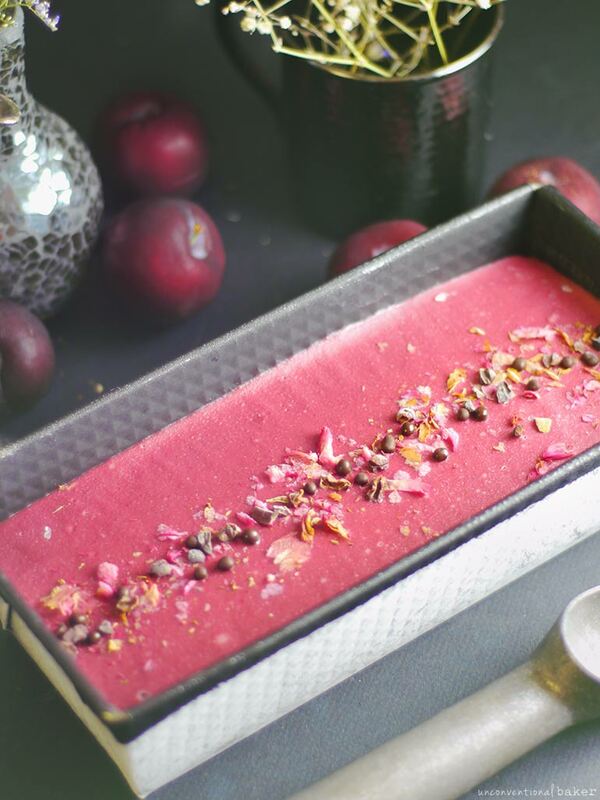 Although you are Audrey, so I would expect nothing less :D The flavors sound just as beautiful as the presentation, I love the pinch of cardamom in there too! Hehe. Decorating happens to EVERYTHING around here ;) ? This sounds perfect. And it just happens to be the prettiest color! Thanks, Ashley! :) I love the color too.